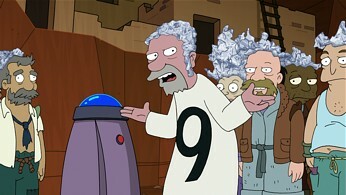 am not addicted to Futurama, I am not addicted to Futurama. So I own a couple of the seasons on DVD. (Okay, all of the seasons.) I may even have picked up one of the comics just out of curiosity. (Okay, all of the comics.) And sure, I had to get the first movie. And, of course, this fourth movie. (And maybe the ones in between.) 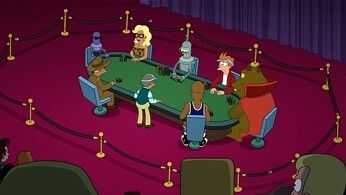 I swear I’m not addicted to Futurama! A couple of years ago Futurama, the animated series much maligned by Fox with erratic schedules, frequent preemptions and a complete lack of publicity, had somehow managed to claw its way out of the overflowing graveyard of excellent Fox shows cancelled before their time, by securing a deal for four new movies. My, how time flies. This, as you may have guessed, is the fourth and sadly last in that quadrology – and the second one for me to review on Blu-ray. While on Mars visiting Amy’s wealthy parents, an Fry has a near-death accident, after which he discovers that he can read minds. He is soon contacted by a mysterious group, who wants him to save the universe by stopping Amy’s father from building the universe’s largest mini golf course through an important star system. Meanwhile, Leela joins a group of eco-feminists that have their own ideas on how to save the universe. Having just watched Bender’s Game a few days prior, I had begun to think that the Futurama movies were trending downwards rather than improving as the quadrology progressed. Fortunately, Into the Wild Green Yonder bucks that trend, improving upon the third movie and sliding in above the second – about on par with the first. So it’s pretty good, but still doesn’t approach such amazing television episodes as Jurassic Bark, Roswell That Ends Well, The Luck of the Fryish, or The Devil’s Hands are Idle Playthings. As a possible [second] conclusion to the series, I’m pleased to see that Green Yonder does offer some closure, although in a more open ended fashion compared to the final television episode – I’m left wanting to know what happens next! 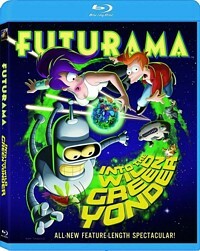 For those left unsatisfied, rest assured that the door may not be completely closed on Futurama just yet – rumors abound that due to decent DVD sales, there may yet be interest from Fox in a sixth television season. We can only hope! As was the case with Bender’s Game, the animation quality in Green Yonder is really quite good for a direct-to-video release. Its high definition widescreen format gives it a far more epic look than the television episodes ever had, delivering an incredible level of clarity and vibrancy that makes it feel like you’re looking straight into the writers’ imagination. Okay, perhaps that’s a bit much, but the artwork has been very well polished and is more colorful than just about anything I’ve seen before. The quality of the animation has also been knocked up a notch from the third movie – I guess practice does make perfect – with none of the obvious lipsyncing issues that I saw earlier, and even the character outlines appear more consistent in thickness. Sure these are small details, but they’re important for anyone who watches Futurama for the high quality artistry as much as the great sci-fi humor (and speaking of the humorous art, keep an eye out for some fantastic sign gags in this one). Fox has once again used a high bitrate 1080p AVC MPEG-4 encode, and it’s even better than the excellent one used in Bender’s Game. The bitrate holds fairly steady around 31-34 Mbps for scenes with any sort of motion, dropping down to a still respectable 18-21 Mbps for mostly static shots. The transfer is as good as one could hope for: no visible compression artifacts or edge enhancement, smooth color graduations, and absolutely no hint of noise or image grain. It’s eerily flawless! Okay, so Futurama isn’t directed by Michael “explosions go boom” Bay, but for a sci-fi movie, even an animated one, the soundtrack on Green Yonder isn’t especially active. Some initial subwoofer-heavy scenes in the introduction drum up hope for an audio extravaganza, but it quickly returns to what has become the norm for the four Futurama films: crystal clear dialogue, carefully placed sound effects, key ambiance, and limited musical accompaniment. This “less is more” approach does keep everything clear and intelligible with no sound going to waste, but if I could ask for anything it would be more background music! Keeping up their high consistency on Blu-ray technology, Fox has utilized a lossless DTS-HD Master Audio encoding in 5.1 surround – with no other audio options. But that’s fine, since I’ve always felt that every Blu-ray release should have lossless audio and Fox has been one of the most dependable in this regard. In fact it’s their reliance on DTS-HD as the only audio track (which is technically against BD format guidelines) that’s likely responsible for almost every new player supporting the format – as well as firmware upgrades for numerous older players that never had it to begin with (such as the PS3). Into the Wild Green Yonder has a rather large list of bonus features, almost all of them offered in HD. Commentary: Always a highlight of any Simpsons or Futurama release, these commentary tracks are rarely informative, but always entertaining. For the Blu-ray release Green Yonder has been given a special Bonus View (Profile 1.1) commentary, with a picture-in-picture window of the voice actors in a studio, talking about the movie. The window is placed into the lower right side of the screen, and can’t be resized or shifted around. Several camera angles are used, but I really didn’t find the video added much to the commentary experience. Note that some BD players may not play back Bonus View with the correct audio track if they have been configured to use lossless audio. The commentary track also gets its own subtitle tracks in four languages. Animatic (480p/2.0): A 22-minute long storyboard animatic using black and white sketches from the planning stage, complete with sound effects and dialogue. 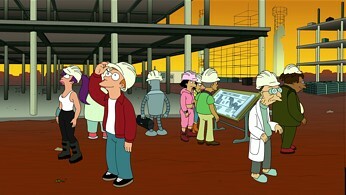 Docuramarama (1080p/5.1): A 5-minute behind-the-scenes look at the making of Futurama. Or so we’re led to believe… they must really save on labor costs! “Louder, Louder!” (1080p/2.0): Penn & Teller (OK, Penn) talking about his guest spot in Green Yonder. Golden Stinkers (1080p/2.0): Ah, finally, a decent collection of deleted scenes! For Green Yonder we have 5 scenes, most finished, a couple still in storyboard stage. Matt Groening and David X. Cohen in Space (480p/2.0): Four and a half minutes with the two creators as they experience weightlessness on a Zero-G flight. 3D Models with Animator Discussion (1080p/2.0): The feature title that describes itself: various 3D models from the film, with the animators talking about them. Bender’s Movie Theater Etiquette (1080p/5.1): What not to do in a movie theater. Zapp Brannigan’s Guide to Making Love at a Woman (1080p/5.1): What not to do with a woman. Easter eggs: Observant menu navigators will notice two hidden links to fun stuff. I’m not about to spoil them here! As a [final] finale to the Futurama universe, Into the Wild Green Yonder might not deliver everything that die-hard fans would have wanted, but with any luck the series will get renewed and the writers will have yet another shot at coming up with the perfect conclusion. Green Yonder is a satisfying movie starring our favorite Planet Express crew, loaded with humor, presented perfectly on Blu-ray, and packed with enough bonus features to keep you busy for some time. Do your part to help bring back Futurama for a third run – buy the disc now! And if you feel that audio and video quality isn’t reason enough to get this version as opposed to the cheaper DVD, just remember that instead of coming in a “carbon neutral” cardboard case – the ones that are impossible to get into, scratch your disc, and then disintegrate all in the course of a week – when you buy it on Blu-ray it comes with a normal plastic Blu-ray case.